Your most valuable resource is your team. They’re the ones get the work done according to the schedule and budget approved. It’s not an easy job. You need to support them, but you must also manage your team so they’re as being as productive and efficient as possible. That’s a fine line to walk. You don’t want to micromanage your team and risk sapping their morale. At the same time, if you don’t provide either a framework or tool to monitor and direct their autonomy you might find your project going off the rails and not have the time to bring it back. Difficult as it might be, there is a way to do it. Project resources can be tracked online through software, as well as managed offline through effective leadership. process, as you do in every aspect of a project. You can do resource planning, project resource management, resource allocation and employ project resource management tools, all to find that right balance. You can’t expect results from your resources until you know who your resources are. That’s why we start with that bedrock of project management, the list. Make a detailed list of all the resources you’re going to use to complete the project. Be as detailed as possible. You can always cut things out, but you don’t want to have to add things later when it might be too late. Once you have a team assembled, you’ll want to include them in the resource planning. Only by working with your team members will you be able to discern who needs what to accomplish the tasks. Some team members might need more time and support, others might require additional people or equipment, but you can’t make those adjustments to your plan until you know how to allocate your resources. Scheduling the resources is next. You have resources to accomplish your tasks, but you should set them out across a timeline. This is best done with an online Gantt chart, so you can assign the work to the team while also planning out the task schedule. this gives you a visual representation of the duration of each task and who is responsible for that task, and you can also link relevant tasks together, to indicate when resources are blocked or reliant on each other. The overall allocation of resources, then, is best done by working back from your deadline. Total the resources you use each week and you’ll get an idea of how to have your team work within the constraints of your schedule to meet the project goal. Just as when you’re planning for non-personnel resources, such as materials and equipment, it’s best to plan for things you might not need. Of course, you don’t want to go overboard and overextend yourself. You are working within a budget. However, it’s best to plan for as much more as you can afford so you have those resources ready to be in play if you need them. Resource planning is less complicated when you can break it down into these smaller parts. A good way to do this is with a Resource Breakdown Structure (RBS), which is a way for you to order the list of resources you’ve collected. Basically, you’re putting them into a hierarchy, either according to a hiring organization, geography or some other criteria. You decide what the relevancy of your structure is, according to your project goals. 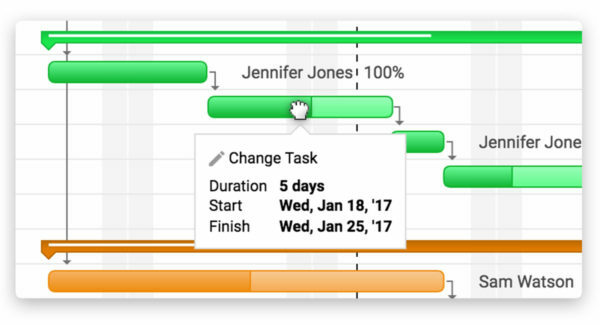 You should be able to get a WBS view right from your Gantt chart. That brings us to what resource planning really is: it’s financial planning. If you had unlimited funds, you’d be able to cover all your bases and be prepared for almost anything. But you don’t have a bottomless well of capital at your disposal. Look at what your expenses are and spread them out wisely. Be sure to set up your project management software to account for the hourly rate of your team and equipment, as well as define their skills, so you can track costs and payments throughout the life of the project. You’ve made the plan, now you must manage it as you move through the various stages of your project. After you have your list of resources, schedule and deadlines, you now should figure out which resources are working on what tasks. The goal is to make sure that you’ve managed your team so that no one person is over-allocated or under-allocated. 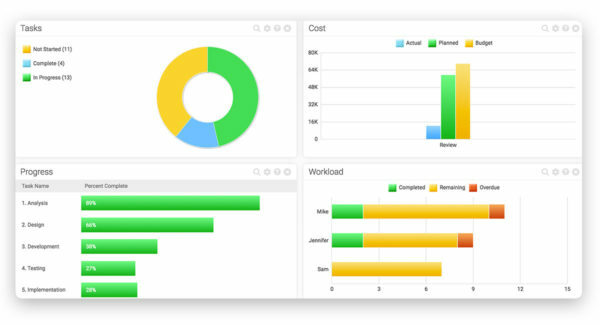 You need a workload management tool as part of your project management software to view the planned effort of your team’s tasks to be able to track that against their actual effort. You’re also going to have to adjust your plans and schedule, to some degree, to the plans and schedule of your team. Yes, they’re employees, but that doesn’t mean they don’t get sick, plan vacations and then there are holidays that are going to impact the project. Some dates you can plan for, such as vacation time and holidays, but others are going to require a day-today maintenance. Be sure your workload tool supports showing holiday and working or non-working days, so you can easy see when someone is available or not. One way to follow the fluctuating schedules of your team is by employing timesheets. 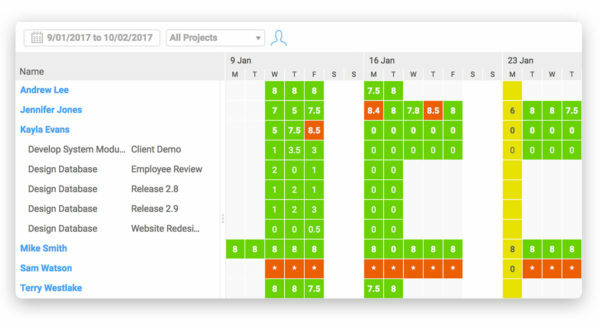 By having your team use timesheets, you’re able to not only track their progress over the course of the project, but you now have a window into their availability. As soon as they know if they’re available, you know, and can act accordingly. It’s best when the timesheets and workload management are rolled into your project management software, so you’re not juggling data between two systems. You’ve planned and you’re tracking, and both are done using your project resource tracking software. Now the offline part: leadership. Here are some tips that can help guide your resource management, so you can effectively lead your team. Participate: Some project managers are like puppet masters, seated above the action and pulling the strings. While this might work for some. It’s not going to prove effective for most. That’s because you must be in the trenches with your team, so you know what’s happening in the project and the people it’s happening to. Otherwise, how can you productively manage? Delegate: While you want to be part of the process, you can’t be everywhere, all the time. If you try, you’re going to stress and break. Yes, there are responsibilities that only you can do. But there are other jobs that can be delegated, and should be. Communicate: The best laid plans are going nowhere if they’re not articulated clearly and disseminated to the right people. A project leader is a great communicator, first, and then knows the best channels to reach whomever their target audience is. Meetings: One way to communicate effectively is through meetings, whether in groups or one-on-one. Meetings are notorious time-wasters, but that’s because they’re either being called for no reason or they’re not being lead properly. A good meeting is one that delivers its message without any time wasted, and those who leave the meeting can work better. Of course, the biggest tip when working on getting the most out of your resources is to use the right resource management tools. Tools can talk all your planning and management of resources and facilitate the process so you can do a better job at it in less time. One benefit is being able to view all your work across you team on one page. This is a bird’s-eye view which gives you the perspective to schedule ahead with ease, because you can see at a glance the allocation of each team member. When you do have to reassign a team member, giving them more or less work, a resource management tool gives you that feature with just a click of the keyboard. Instead of having to take up your valuable time assigning team members, you can simply use a pulldown menu and the task has been reassigned. Resource management tools also help you get the information you need fast. You don’t have to go through spreadsheets and other data dumps, the software does it for you by color-coding. Like a red flag, you can see if someone is overallocated, while other colors mark someone who is allocated or out for whatever reason. Looking for how to allocate your team evenly has never been easier. When that resource management software is online, then you’re given the extra-benefit of monitoring your human resources in real-time. From the dashboard view, you’re given reports on every aspect of your project’s progress, across scheduling and budget, as well as resource management. You can watch your team’s workload in real-time, and then you can also generate dynamic, graphic and clear reports with a keystroke, which can then be shared and exported in any number of formats. Making sure you team is properly allocated over the life cycle of your project is how you can run a successful project, within budget and on schedule. It’s a large task, but more manageable when you’re using the right tools to control all the various responsibilities. ProjectManager.com is a cloud-based project management software that helps you plan, monitor and report on your resources, giving you the power to direct your project. Try it for yourself by taking this 30-day trial.